Puerto Rico, here I come! I fly out today and leave my pups in the able care of the housesitter…..and I’m off to paint paint paint! 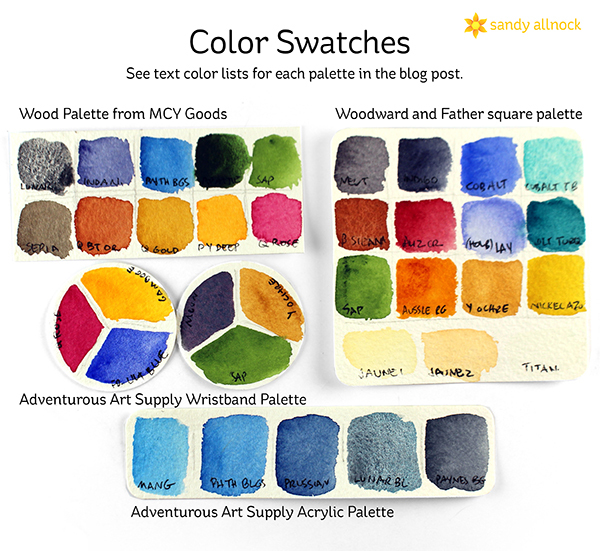 I was talking with my dear friend Lisa Spangler about palettes since she’s the Queen of Tiny Palettes – and she agreed to also do an overview of her palettes. When I shopped I bought different ones than she had so we’d have a good broad range to share with you. So be sure to go to Lisa’s blog to see more when you’re done here! The Puerto Rico trip is the start of a fundraiser: after I get paintings finished, I’ll put them up for auction to raise monies to help our fellow citizens. I’ll be creating some there, but also some when I return home and have time to paint more. So stay tuned! And feel free to give money to charities there now in advance of the fundraiser…no need to wait if you’re feeling ready to be a giving human—giving is good for your heart! All the palettes I purchased are from Etsy…got to love supporting small creative businesses! In the video I show you the palettes, what I liked about them, and fill them – then in a month or two I’ll go back and let you know how they actually worked. (I may have more specific immediate details on Instagram so keep your eyes open there for the next week, too!) Watch the video below or click HERE to see it in HD on YouTube. Here are stills of each palette…..Wristband palette, Acrylic Palette, Big Brush Tin Palette, and Wood/Leather Travel Watercolor Kit. Color swatches for each of the palettes: you may not be able to read my scribbled notations, but if you check the list in the supplies section, they’re in order of what’s shown here. 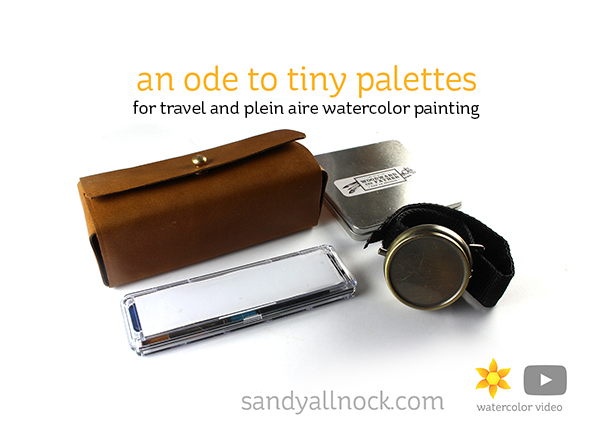 Don’t forget to go see Lisa’s blog post – she has different tiny palettes! Alvaro Castagnet sketchbook —- only available directly from the artist during classes. So super cute ! I love that you’ve gone to Etsy to give small businesses a chance, I buy a lot through Etsy for gifts. If better brushes do make you a better painter let me know as I better start buying , does the same work with coloured pencils ? Looking forward to seeing your travel paintings. Safe journeys. Thanks for posting this – I already went and ordered a wrist palette for myself! 😀 So excited! What a super cause. Safe travels. Who knew there were so many tiny palettes! Have a wonderful trip. Will be very interested in how you find the island. Bon voyage – enjoy your mission in PR and come back to us soon! Can’t wait to see the island thru your eyes – and we will count the days until you return.